Very good condition. 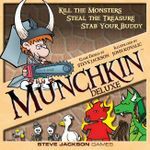 Munchkin Deluxe version pictured here. All cards are sleeved and there are also some Munchkin bookmarks in the box. I have all the expansion boxes but everything is packed in the Deluxe box.